When it comes to the “Seneca family,” one thing that is near and dear to their heart is protecting their home field when the lights come on Friday nights. Home field advantage for the football team has become a tradition at Seneca High School with the creation of the “Bird’s Nest” — a name that was developed by the student section that fills the bleachers at every home game to cheer their Golden Eagles to victory. So when the school got the news that NJ.com would be conducting a contest to declare the best home field advantage in New Jersey, students were instantly determined to win the contest. Mitchell teamed with her classmate Samantha Scarpello to enter her school into the competition. 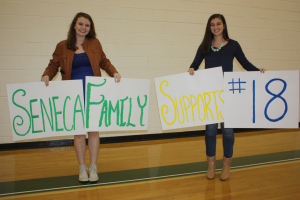 The competitive duo knew there was something special about going to a football game at Seneca and wanted to portray how much the student body and community gets behind the team to the rest of the state. “As a freshman, you’re so excited to go to every game, and as a senior, you don’t want it to end,” Mitchell said. So the two girls teamed with head coach Bill Fisher, and they spread the word to acquire votes through word of mouth and social media. They took to Twitter and used the Seneca Bird’s Nest account, @senbirdsnest15, to alert their fellow students to vote. Scarpello saw this as the perfect vehicle to drive votes, as it was successful in the past when they used it to sell t-shirts for game day or spread the news of a themed spirit day. During the girls’ lunch and learn period, they went around selling t-shirts and promoting home games, they took photos during the games they submitted to NJ.com for the contest, and they even made a video for one of the games in which Fisher donated hundreds of old jerseys they washed and handed out for everyone to wear. The votes were pouring in after this, and Seneca was in great shape to make a serious run at bringing home this competition. However, one afternoon, Scarpello was volunteering at the blood drive for student council and overheard a group of people talking about whom they would be competing against in the competition, and Warren Hills Regional High School was mentioned. But the school was brought up in discussion for a reason that had nothing to do with the best home field advantage competition. Warren Hills quarterback and three-sport star athlete Evan Murray, 17, was injured on a tackle during the second quarter of the team’s game against Summit High School. He flashed his teammates a thumbs-up as he was taken away on a gurney. But not long after, he passed away. An autopsy found his spleen was abnormally enlarged, leaving Murray susceptible to this type of injury. The cause of death was massive internal hemorrhaging from a lacerated spleen. “I immediately just wanted to hug my brother, (Seneca quarterback J.J. Scarpello). It made me step back and think about how lucky I am and to appreciate everything that I have in my life today,” Scarpello said. That’s when it hit Scarpello that this wasn’t about winning the best student section in New Jersey anymore, it was about how Seneca could help support Warren Hills through this tough time. The girls then completely refocused on creating a new campaign, one that would completely negate all the work they had already done and all the hours they had already poured into their original campaign. They were now doing everything they could to get people to vote for Warren Hills Regional High School to beat Seneca and win the competition. The girls told everyone to vote for Warren Hills on social media, had everyone wear blue to school one day in honor of their school colors, raised money for a scholarship in Evan’s name during their Turkey Bowl game on Thanksgiving and also sent a package with a signed Seneca football helmet with all of the members of the Seneca student section names on it. That helmet now sits in the hallway at Warren Hills Regional High School where it is displayed as a symbol of compassion from a competitor. They wrote Seneca a heartfelt letter thanking them for the kind gesture. Seneca also received a video from the Warren Hills’ student section, “The Blue Crew,” thanking them for the helmet. Seneca athletic advisors Kathy Donoghue and Brad Bauer, guidance counselor Erica Maira and Fisher were 100 percent on board with the idea when the girls approached them. The girls could not say enough about how thankful they were for their support and alluded to the fact that they could not have gone through with it without them. The school reacted the same way the girls did when they got wind of the news and immediately ditched the idea of voting for themselves and started accumulating votes for Warren Hills. While Seneca still ended up getting the most votes for the South Jersey bracket, Warren Hills won the North Jersey bracket and took home the №1 overall prize of being granted the best place to watch football in New Jersey. The girls accredited how much they learned during this experience by acknowledging a quote from their favorite guidance counselor. “A little love can go a long way,” Maira said. “We did it because we wanted to help, but the reaction and feedback we have gotten back has been overwhelming,” Scarpello said.